Lexus sales in the U.S. rose 6.2 percent in 2010, putting them ahead of German rivals BMW and Mercedes-Benz. MICHIGAN (Bloomberg) – December sales of Toyota Motor Corp.'s Lexus topped BMW AG's BMW brand and Daimler AG's Mercedes-Benz, helping the Japanese brand secure the top spot in U.S. luxury auto sales for the 11th straight year. Lexus sold 27,560 cars and sport-utility vehicles in December in the U.S. and 229,329 for 2010, the automaker said on Tuesday. The brand's sales fell 3.5 percent in December from a year earlier while rising 6.2 percent for all of 2010. 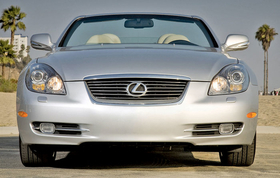 The Lexus annual lead over BMW shrank to 9,216, less than half the 19,473 gap in 2009. Mercedes' U.S. sales increased 14 percent last year, leaving the automaker's brand in third. Among other luxury brands, General Motors Co.'s Cadillac boosted deliveries 35 percent for the year, while the Audi brand of Volkswagen AG sold more than 100,000 vehicles in the U.S. for the first time. “The availability of credit and the availability of leasing mechanisms have certainly helped the entire industry,” Kurt McNeil, Detroit-based GM's vice president of sales for Cadillac, said in an interview. Demand for large luxury sedans rebounded in 2010, Johan de Nysschen, president of Audi of America Inc., said in a telephone interview. BMW's U.S. sales rose 16 percent to 23,280 for December and 12 percent to 220,113 for the year, according to a statement from the automaker. Mercedes reported U.S. sales of 20,090 last month, up 0.3 percent, and 216,448 for the year. The results exclude Daimler's Sprinter vans and Smart cars, and BMW's Mini brand, which aren't luxury vehicles. Mercedes had moved within about 2,700 sales of Lexus after the third quarter, a period in which it outsold BMW. Mercedes had “very aggressive lease deals,” including about $300 (226 euros) a month for a C-Class sedan, Toprak said. “It basically brought in all of these consumers who otherwise didn't even think about leasing a Benz,” he added. Lexus more than doubled incentive spending in the fourth quarter from a year earlier, while Mercedes reduced such expenses 6.4 percent and BMW's fell 37 percent, according to Santa Monica, California-based TrueCar. Lexus's incentive increase last month was at a rate comparable to previous years in December, when it holds its main clearance sale, Mark Templin, Toyota's U.S. group vice president for the brand, said on a conference call. “It was never our goal to be No. 1, but we're proud to be there,” he said. BMW's fourth-quarter sales benefited from the arrival of the all-wheel-drive 5 Series sedan, Jim O'Donnell, head of the automaker's U.S. unit, said in a telephone interview. The December gain for the redesigned 5 Series was 29 percent. BMW now has the revamped X3 sport-utility vehicle reaching showrooms, which with the new 6 Series and a full lineup for the 5 Series gives the automaker a shot at overtaking Lexus in 2011, O'Donnell said. “It will be a two-horse race this year and it will be between Lexus and ourselves,” he said. Mercedes “missed a big opportunity” in not passing BMW in 2010 “given the product cycle,” O'Donnell added. Audi sales climbed 23 percent to 101,629 vehicles for the year and 17 percent to 10,546 in December, de Nysschen said. Porsche SE, the Stuttgart-based automaker merging with Volkswagen, said its U.S. sales increased 21 percent to 2,567 in December and 29 percent to 25,320 for the year. GM's Cadillac reported a 13 percent gain to 16,718 last month, for annual sales of 146,925. The full-year growth came at the expense of Lexus, particularly the Toyota brand's RX SUV, McNeil said. Sales of Cadillac's SRX more than doubled in 2010. Ford Motor Co., sold 8,060 Lincoln luxury vehicles in December, a 23 percent drop from a year earlier. For the year, Lincoln sales rose 3.6 percent to 85,828. Honda Motor Co., reported Acura-brand sales of 15,489 for December, a 46 percent increase, and 133,606 for the year, up 26 percent. Deliveries of Nissan Motor Co.'s Infiniti line rose 37 percent to 12,502 vehicles in December and 28 percent to 103,411 for the year, according to a statement from the company. Tata Motors Ltd., reported gains for Land Rover deliveries of 2.8 percent to 3,695 for last month and 21 percent to 31,864 vehicles for the year. Sales for its Jaguar brand fell 5.2 percent to 1,180 in December and rose 12 percent to 13,340 for all of 2010.